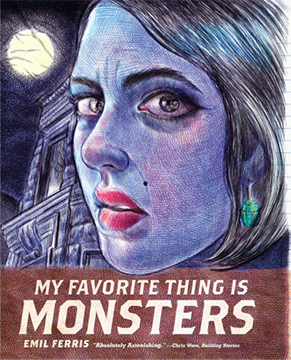 Emil Ferris (BFA 2008, MFA 2010) won three Eisner Awards for her debut graphic novel My Favorite Thing Is Monsters. She won Eisner Awards in the Best Graphic Album–New, Best Writer/Artist, and Best Coloring categories. The 2018 Eisner Awards announced were announced during an evening presentation session this past Friday at this year's San Diego Comic-Con. As per the Hollywood Reporter, Ferris made "near-clean sweeps" in all the categories she was nominated in. The critically acclaimed My Favorite Things Is Monsters is not new to the award circuits, having won the 2017 Ignatz Awards for Outstanding Graphic Novel and Outstanding Artist. My Favorite Things Is Monsters has also been nominated for this year's Hugo Awards, which are awarded to distinguished literary works of science fiction.